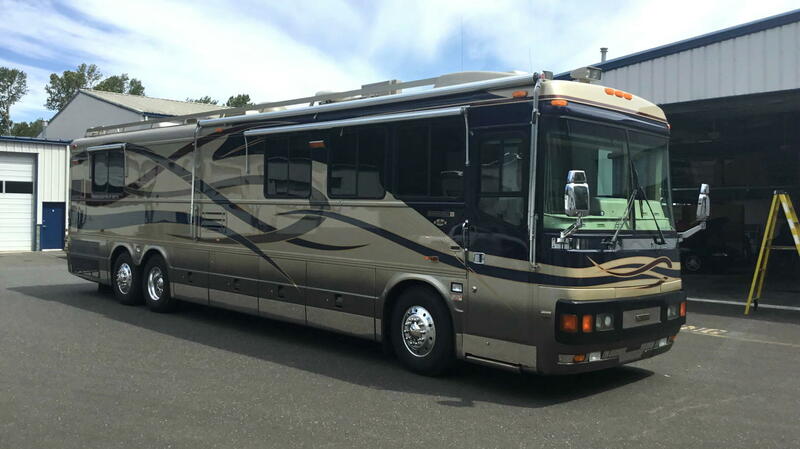 SOLD #836 WA 2001 LXI 43 Millennium Edition with only 34,824 miles on this gently used, double slide out coach. OWNER IS MOTIVATED TO SELL! This seasoned Blue Bird owner wants to move this coach! THIS LIKE NEW CONDITION COACH IS PRICED AT $149K!!! 315.80 Michelin tires are three yrs old and batteries replaced two yrs ago. Front and rear TV's replaced in 2015. The owner has the Blue box with manuals and maintenance records. 500 HP Series 60 Detroit has 894 engine hours. 15KW Power Tech generator with auto start has 269 hours. EXTERIOR has a stunning paint scheme in colors of concord blue over light beige base with maroon, blue, gray, and gold accent stripes and Stainless steel package. Remote controlled chrome heated review mirrors. INTERIOR has galley-salon slide and bedroom slide. Brass toe kicks throughout, special triple tiered ceiling panels with mirrored inserts in living room and bed room, laminate cabinetry, granite style Centura Corian counter and table tops with blue and brass edging. Six way power air ride pilot seat and power co-pilot seat are covered in villa ultra leather. Lower dash is ultra leather. Upper dash is black Vitricor. LIVING ROOM has fabric sofa with underneath storage, Centura topped end table, Ekrones recliner with foot rest, Centura topped computer table, overhead TV, recessed downspotter lighting, carpeting, solid surface window sills, and infinity shades with coordinated valances. KITCHEN has Centura counter top with blue and brass trim, brass pulls, brass Grohe faucet with brass Konstant hot, special tile backsplash with blue and brass inserts, etched wall divider, micro-convection oven, double door Dometic refrigerator with ice-maker, and pull out pantries. Dining area has round stemware cabinet, Centura topped dinette table with two chairs, mirrored wall, kitchen style overhead cabinet and extra Centura topped base cabinet. Diagonal laid tile floor in galley and bath. WALK THROUGH BATH has Centura topped vanity and sink, full face mirrored medicine cabinet, stacked washer and dryer, private toilet with lavatory and window, large double mirrored door closet behind toilet, and etched glass round front shower with tile inlay. BEDROOM has cross queen island bed with window behind bed, bedspread with coordinated window treatments, overhead cabinet, infinity shades, Centura topped night stands, mirrored door walk in closet, built in 20" TV, and carpeting. GENERAL This coach is loaded with special options including keyless entry, steerable tag axle, air dump valves, bulk oil fill, power cord reel, cargo bay freezer, roof rack and walk plate, solid surface entrance steps with brass grab handles, security safe, Joey bed in pass through compartment, BBQ grill, Zip Dee lawn chairs, aux. air compressor, Trac Star satellite system, Pioneer GPS system with radio and CD changer, Thermopane windows, altimeter, AC units with heat pumps, and Detroit engine Pro-driver. This garaged, no pet, non-smoker coach is in excellent condition inside and out. Call 217-826-8907 for details on this extra nice, low mile coach.